Builder Bruce Lowell built a bust of Boba Fett using a technique he made popular known as the Lowell Sphere but left it unfinished 5 years ago. 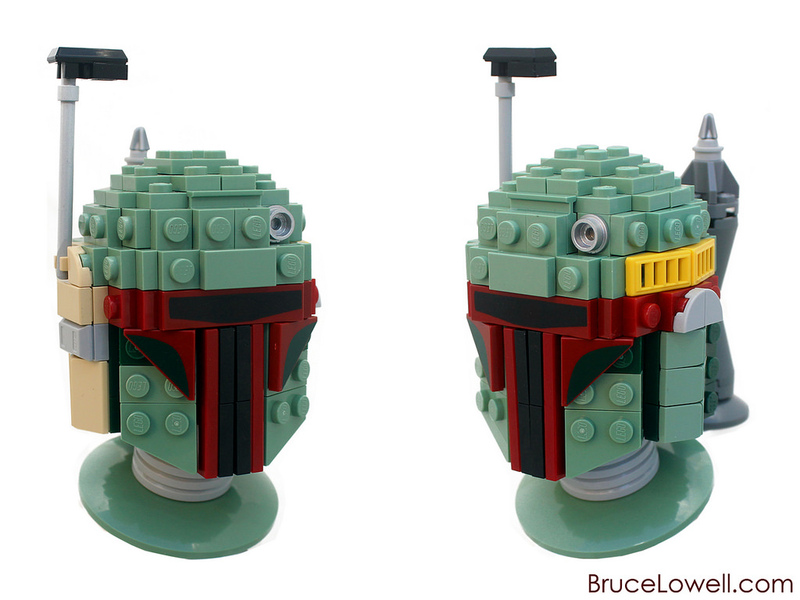 It was only now that he picked up the recent Boba Fett BrickHeadz which came with the 2×2 printed triangle pieces that it made sense to revisit the project. Sometimes you just need the right part to come along to inspire you to finish an outstanding build. 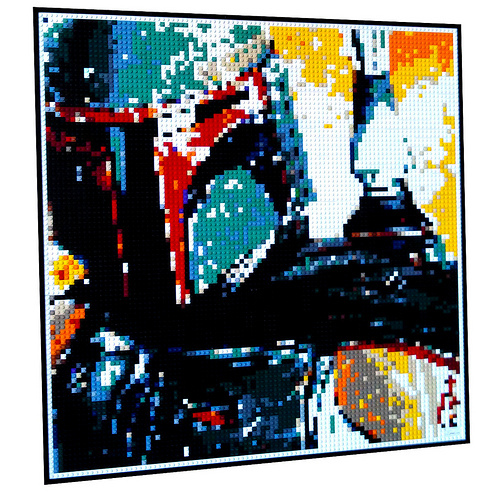 The result speaks for itself with the instantly recognisable bounty hunter from a galaxy far far away. LEGO Star Wars is returning to the planet Bespin with 75222 Betrayal at Cloud City, a 2,812-piece playset based off memorable scenes from The Empire Strikes Back. 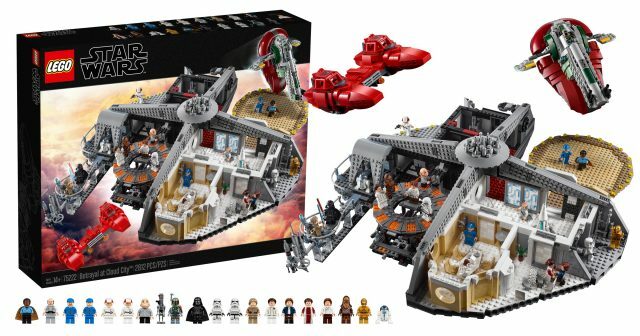 The set includes a whopping 18 minifigures, two droids, and two vehicles: Boba Fett’s Slave I ship and a twin-pod Cloud Car. 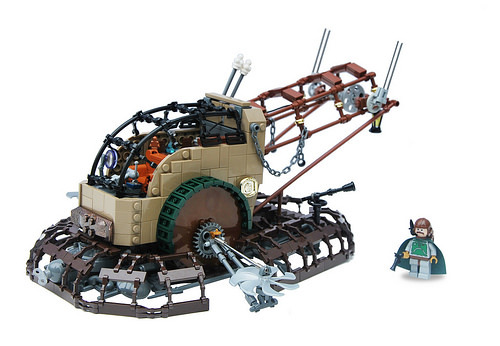 The set is also the first in the newly revealed LEGO Star Wars Master Builder Series. Betrayal at Cloud City will hit stores on October 1st for $349.99 USD, and will be available early for LEGO VIP members beginning September 13 at the LEGO Store Online. 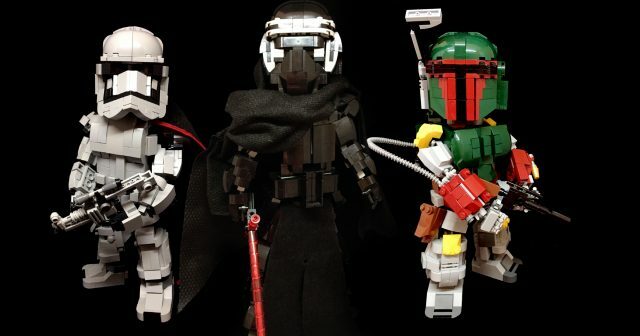 You can tell that Nathaniel is a fan of Star Wars just by looking at the way he has lovingly upgraded the recent Boba Fett buildable figure set. Everyone’s favourite Mandalorian looks noticeably filled-out with new anatomical details added in the form of cleverly integrated brick built thighs. A number of other neat touches to his armour provide detail and a samurai twist. I suspect Nathaniel knows his Star Wars lore, specifically George Lucas’s debt to Akira Kurosawa’s epic The Seven Samurai, referencing the connection in the theming of his creation. 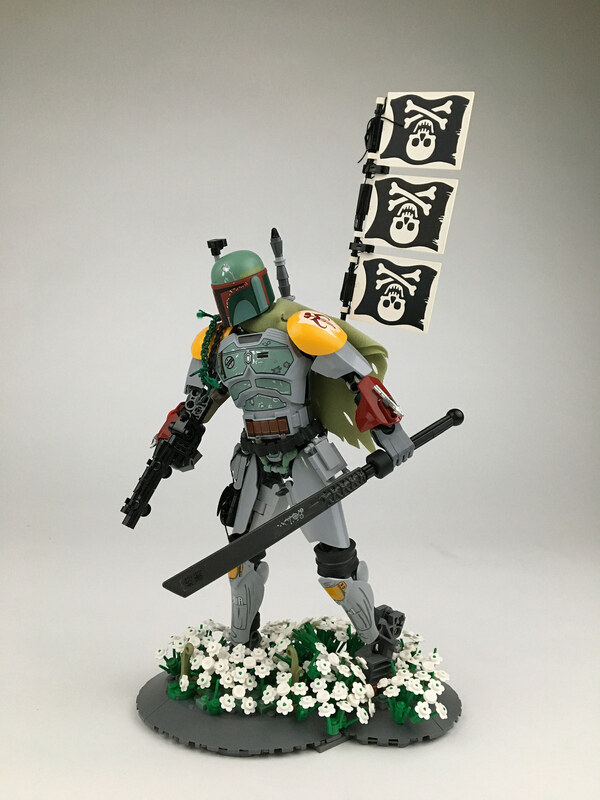 I have to agree, that the bounty hunter reimagined as samurai warrior, banners flying, Katana in hand, striding across a flower-laden Shogun era meadow, looks amazing. With the next installment of the Star Wars franchise nearing once again, we’re starting to see the amazing community of builders turning their incredible skills to a galaxy far, far away. These larger doll-sized builds by Herbert Lee from Hong Kong are a prime example. 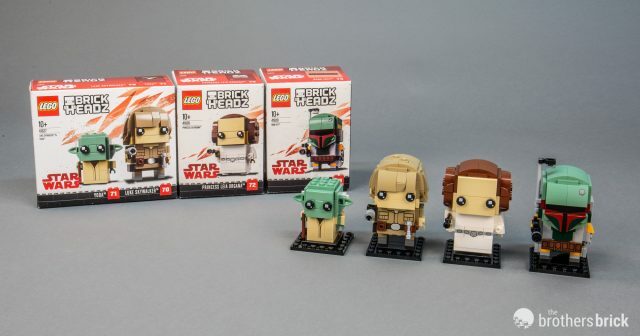 With a multitude of articulation points to give life-like poses from any iconic scene from the movies, these figures stand about 8-10″ tall and are a considerable step up from the LEGO Star Wars BrickHeadz figures. Herbert has built eight characters from across all three trilogies. Let’s take a look at each one of them in their best poses. 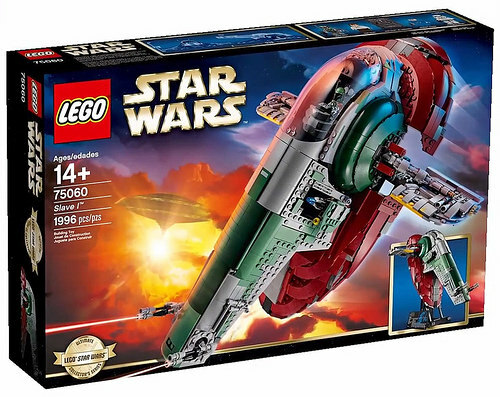 The good folks over at LEGO sent us an advance copy of the new flagship set for the ever-popular LEGO Star Wars line, 75060 Slave I. Ever since I first saw Star Wars Episode V, I’ve thought the Slave I was one of the coolest ships in the Star Wars fleet. A truly unique design for a spaceship (in 1980 when Empire released), the Slave I lies on its back for landing, but stands upright for flight, the cockpit and wings rotating to retain orientation. LEGO has released 4 previous minifig-scale versions of this ship, two for each color scheme from the new and old Star Wars trilogies, plus another five versions in smaller scales. 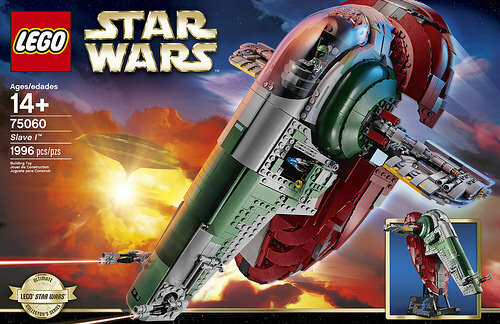 So this new Slave I fittingly is the tenth version of the ship from LEGO, and is unquestionably the best. Make no mistake, this is a big set — a very big set for being minifig scale. 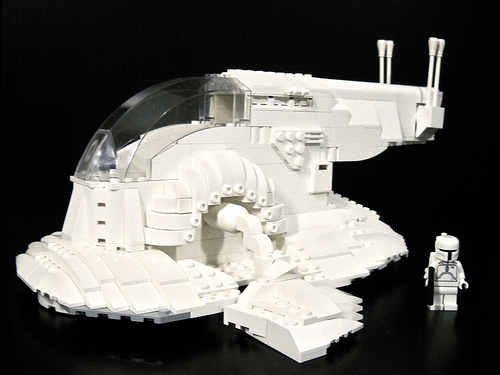 The Slave I is a deceptively large ship, and LEGO’s previous minifig-scale versions have not done it justice. The very first Slave I (7144) released in 2000 was almost laughably small at 166 pieces, but I still harbor fond memories of it. The new 75060 Slave I clocks in with 1996 pieces and is almost 2 feet long from tip to tip. Earlier this evening here in Seattle at BrickCon, LEGO officially unveiled the new 75060 Slave I. Unlike every other incarnation of this set, the UCS version is truly minifig-scale, and includes Boba Fett, Han Solo (with carbonite), a Bespin guard, and Stormtooper. With nearly 2,000 pieces, the set will be released in January 2015 for $200 in the US (full pricing details in the press release later in the post). We had a chance to take a close look at the new set at BrickCon. Play features include everything you’d expect — pop-out blasters, revolving cannon, rotating wings, etc. See nearly 20 official photos in the photoset on Flickr. 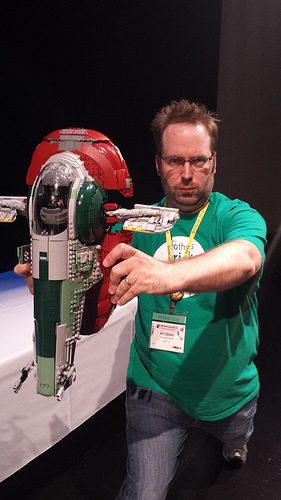 Slave I is quite swooshable, as I demonstrate with my Hadouken! pose. Here’s the full press release from LEGO. Lift off for bounty-hunting adventures in the Slave I! 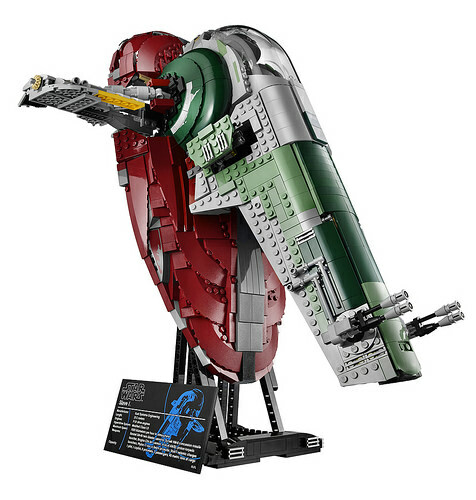 Search the galaxy for fugitives with Boba Fett and his Slave I with rotating cockpit and wings, dual shooters and a display stand. Track down fugitives with legendary bounty hunter, Boba Fett aboard the powerful Slave I! This exclusive LEGO® Star Wars model features a rotating cockpit and wings for flight and landing mode, plus dual shooters and hidden blasters to repel attackers. Reenact the capture of Han Solo in Star Wars: Episode V The Empire Strikes Back and take off from Bespin with the carbonite-imprisoned Rebel hero in the cargo hold. Attach the stand to display this iconic ship in characteristic upright flight. Includes 4 minifigures with weapons: Boba Fett, Bespin Guard, Stormtrooper and Han Solo. Also includes Han Solo in carbonite! Finally, here’s the designer video. Be sure to watch it to catch a pretty hilarious play feature. 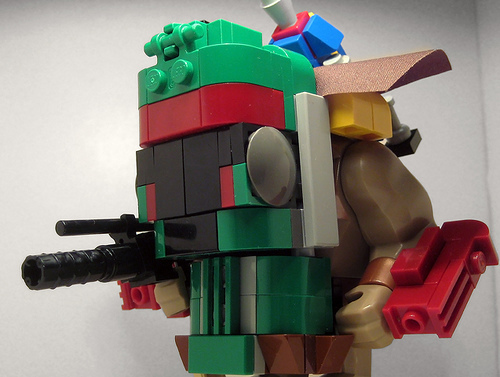 Jonas (Legopard) built a steampunk version of Boba Fett’s Slave I. The caged appearance of various parts of the ship is fascinating, and the introduction of dark green adds a nice touch of color. Well, I’ve had the place to myself this weekend and it’s been fun spinning the tunes for your weekend pleasure. 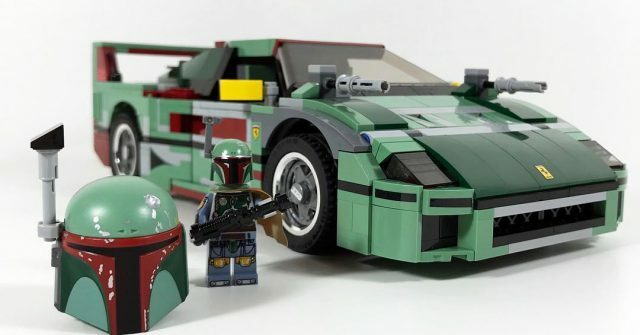 Diamond Dave Shaddix is late to the party but he’s arrived just in time with a case of beer, a bag of barbeque potato chips and this colorful mosaic of Boba Fett. I can think of no better way to end my shift. I recall getting into fisticuffs with a fellow 6th grader over a Boba Fett doll back in the day…some things are worth fighting for. Have a great week. …but it’s a great idea nonetheless. Joel Baker decided that the rare white Boba Fett needed a white Slave 1. So, unlike most people on the internet, he decided to do something about it, rather just whine about how Lego doesn’t cater their individual whims. Way to go, Joel. You’re the man! Now I want to see more monochromatic Star Wars ships.